On a recent trip to Ireland, UIS President Paul Loftus had the unique opportunity to meet the newly-elected 349th mayor of Dublin, Nial Ring. Ring, a businessman, was previously a councillor for the Inner City North area. 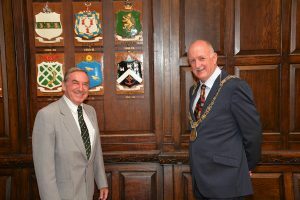 UIS President Paul Loftus and Lord Mayor of Dublin Nial Ring stand in front of Former Dublin Mayor Sean Loftus’s Family crest. The UIS recently welcomed former Lord Mayor Michaél Mac Donncha on his trip to Montreal in May.